A reedition of the iconic L'Originelle lamp. Inspired directly by the original 1905 first style A Universelle, from Diamond point inspiration. 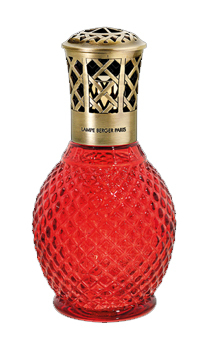 It’s criss - cross mounting in old brass finishing enhance this intense red lacquered lamp. The iconic Originelle, makes its come back with the vintage reedition, ultra-trendy this season. It’s new colour, antique black, brings style, whilst it’s ancient pewter finish criss cross mounting, shows it’s prestige. 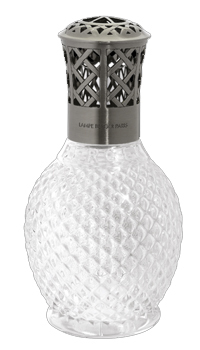 Inspired by the first Lampe Berger designs - in 1898 L'Originelle Lamp, in translucent glass, is decorated with raised "diamond tips". 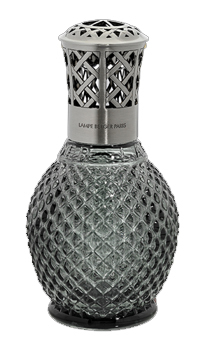 It has a Criss-Cross mounting in metal with weathered tin finish, inspired by the first mountings, and engraved "LAMPE BERGER PARIS".